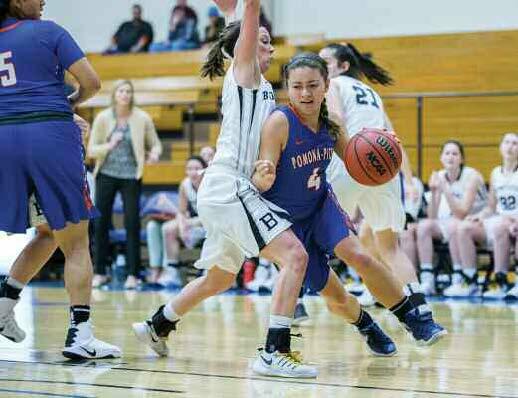 Alaina Woo ’17 stepped to the free-throw line hundreds of times during her basketball career with Pomona-Pitzer. 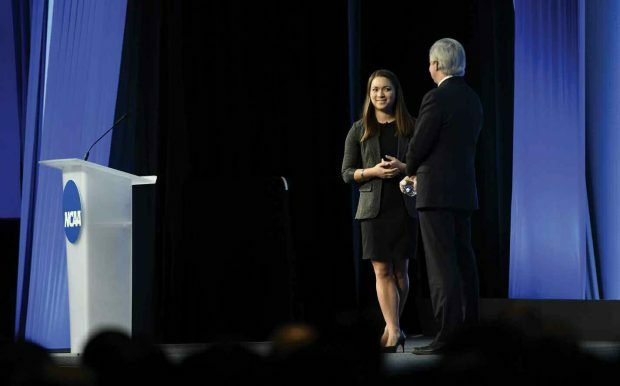 But she had never stepped onto an athletic stage quite like the one at the NCAA Convention in January when she stood in front of nearly 3,000 of the movers and shakers of college sports for a one-on-one talk with association President Mark Emmert. “It was a completely new experience for me,” says Woo, who appeared in her role as chair of the first NCAA Board of Governors’ Student-Athlete Engagement Committee, tasked with considering some of the crucial issues facing college sports—including the hot-button topic of how the NCAA addresses sexual violence. Woo’s role is seeking change from within the NCAA. Now in her first season as an assistant basketball coach at Tufts University while simultaneously working as a research assistant at the Harvard Kennedy School, Woo was deeply active in NCAA issues while at Pomona, where she is the Sagehens’ career leader in three-pointers. She also is ninth on Pomona-Pitzer’s career scoring list and was the team’s leading scorer as a senior. Woo was still a first-year student when a teammate took her to a meeting of Pomona-Pitzer’s NCAA Student-Athlete Advisory Committee. That friend and Lisa Beckett, a professor of physical education and associate athletic director, encouraged Woo to get involved. By Woo’s sophomore year, Beckett—“a wonderful mentor,” Woo says—suggested applying for the NCAA Division III national Student-Athlete Advisory Committee. Woo was selected and represented Pomona-Pitzer’s Southern California Intercollegiate Athletic Conference and the Northwest Conference for a three-year term that ended in January. Among other roles, she also served on the NCAA Committee on Women’s Athletics for Divisions I, II and III. She hopes for further advances on sexual violence issues after the NCAA adopted a policy last year requiring coaches, athletes and administrators to complete education in sexual violence prevention each year. The new sexual violence policy has been an opportunity for the NCAA to reflect on what its role is, she says. Woo’s work at the Harvard Kennedy School, where she is not enrolled as a graduate student but works part-time on a project called Participedia that seeks to crowdsource and map participatory political processes around the world, allows her to continue pursuing the policy interests she developed in her studies at Pomona with Politics Professor David Menefee-Libey. At Tufts, a Division III women’s basketball power that has reached the NCAA title game the past two seasons, Woo got a foot in the door thanks to Pomona-Pitzer Coach Jill Pace, a former Tufts assistant coach. Like a basketball player in position to pass, shoot or drive, Woo is something of a triple threat as she starts her career: She could continue coaching, pursue graduate work in public policy or possibly combine sports and advocacy as an athletic administrator. “I’m still very on the fence,” she says. “When I’m thinking about being a coach in college sports and mentoring young women, I’m thinking all about policies and politics and power and how to best advocate for my athletes or people in the athletic department who are struggling with things outside of athletics. Here are a few highlights from the 2017–18 seasons of Pomona-Pitzer Athletics. The football season was also marked by a series of team records. Aseal Birir ’18 set both the all-time career rushing record (3,859 yards) and the single-game rushing record (275 yards), and Evan Lloyd ’18 set an all-time record for career tackles with 275. The men’s basketball team won 13 of their last 16 games to advance to the finals of the Southern California Intercollegiate Athletic Conference (SCIAC) tournament before losing to CMS. For the women’s team, Emma Godfrey ’21 was named SCIAC Newcomer of the Year after tallying at least 30 points in six games. Both the men’s and the women’s teams won SCIAC championships, the second in a row for the women and the first in program history for the men. Maddie Kauahi (PI ’19) won SCIAC Female Athlete of the Year; Mark Hallman ’18 was Male Athlete of the Year; and Lukas Menkhoff ’21 was Newcomer of the Year. For the second straight season, the men’s water polo team claimed the SCIAC title both in the regular season and in the conference tournament. Daniel Diemer (PI’18) was SCIAC Player of the Year. The men’s cross country team won its first SCIAC title since 2005 and finished sixth at the NCAA Championships. 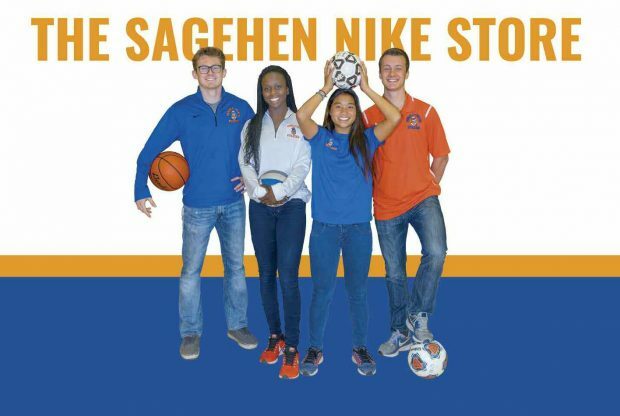 Sagehen apparel is now available from the Sagehen Nike Store.